For Mother's Day I made two things for the family get-together. (It was a cookout, with burgers, steaks, hot dogs; Mom made potato salad, etc.) I made a tomato and corn salad, and a cake. 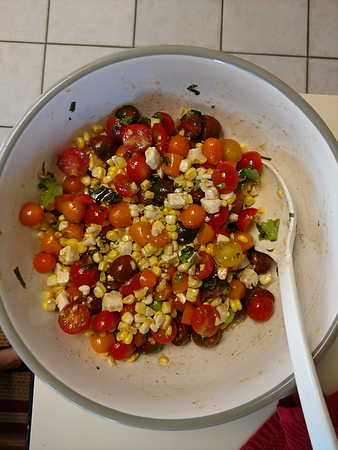 The tomato/corn salad also has feta cheese and a vinaigrette dressing (not balsamic). None of my tomatoes/corn were ready for this - okay, that's a lie, but I'm saving my own tomatoes for straight up eating :P I bought a pint of mixed color cherry & grape tomatoes and cut them in halves or thirds and that was fine. This is not a good picture of my cake but I was very proud of the cake. 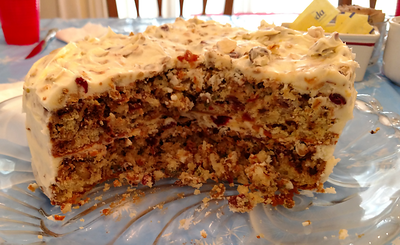 New recipe, "trail mix cake" - it has craisins, coconut, sunflower seeds, mini chocolate chips, diced dried pineapple, sliced almonds, probably something else I'm forgetting. It has a lot of stuff, is the point. As Dad said when I served it, "I'm sure there's some flour in there somewhere to hold it all together." It also has a homemade buttercream (yes! I did it!) and the only real flaw there is that Mom likes her cakes refrigerated and buttercream seems to need serving at room temperature. The top/filling has more Stuff in it and the sides were plain buttercream because I ran out of buttercream and had to make a half batch with the last of the unsalted butter to do the sides. Still: excellent! Though as we suspected, the kids were "ew, fruit and nuts in a cake? gross" so only the adults ate it. As a result, half of this cake is now in the freezer for another time. I intend to make an Almond Joy cake for Father's Day, or perhaps a Mounds cake, since the kids probably won't want nuts in that one either. Then again it'll have coconut so who knows? This entry was originally posted at https://laridian.dreamwidth.org/2895510.html. Please comment there using OpenID. Your almost-grown kids don't like almond cake? Wow, that's actually sad, because they're missing out. We have a classic almond cake we bake in our neck of the woods, and it's so child-friendly it's often served in birthday parties. It was always my favourite of the cakes Mom used to bake for special occasions. I know, right? And AngryDandelion has a sensitivity (not an outright allergy) to most tree nuts because they're chemically related to pine pollen, which he has more of an allergy to, so he won't eat anything that has nuts in it now. Except peanuts, because they're legumes, not tree nuts. He can eat those all day long without trouble. I haven't had almond cake in ages and when it's well done it's so tasty! Forgot to say, both your cake and the salad look very tasty. I've never thought of using tomatos and corn as the main ingredients before. This time I used 1 T of sweet onion instead of shallots, and I didn't get that awful raw onion aftertaste. Still skipped the miso and added another T soy sauce instead. Used feta cheese. Still delicious.